I am spending part of the summer on temporary assignment at our paper mill in southern Ohio, ironically one that I worked at back before my senior year in college at Miami University. Tonight after work, I drove over to Kettering, Ohio, for my first visit to the Krystal Keep gaming store. Located where the previous Wexford Hill Hobbies was located just off I-275, this store offered spacious and well lit gaming areas, with a ton of shelves of terrain, houses, buildings, trees, and other goodies that gamers may borrow at no cost when playing games on their multitude of gaming tables. Cleveland-area miniature wargamer Jim Kopchak, the author of the new rules set Civil War Commander, spent much of yesterday with me touring the new Gettysburg Visitors Center, focusing on the Gettysburg Civil War Museum housed there. We spent a couple hours doing a cursory walk-through, although crowds were very heavy and it was tough to spend any appreciable time at any single display case. I took a few shots, although the majority of my photos did not turn out as the camera’s museum setting failed me, and darkness reigned. Flash photography is forbidden in the VC, as I found out during my last visit when I made the acquaintance of a NPS ranger I had not previously met. 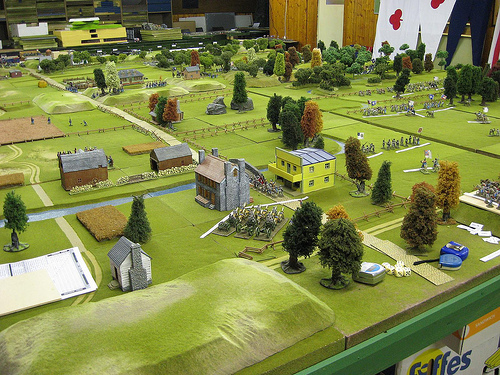 One of the highlights of the afternoon session at the HMGS-East Historicon 2008 in Lancaster, Pennsylvania, was a massive Fire & Fury game recreating Day 1 at Gettysburg using the classic Fire & Fury rules set. 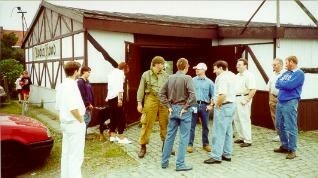 Here, the townspeople huddle in their tiny cellars as the sounds of war emanate from the west, where Buford’s cavalry have held on long enough for the I Corps to arrive. Some gnomes or other such fantasy creatures are on the attack in this colorful game that attracted a fair amount of onlookers. They were commanded by a tiny bearded Santa wizard figure – a far cry from Robert E. Lee who commanded the troops in the first picture. Maybe Santa had more luck in his attacks than did Marse Robert? 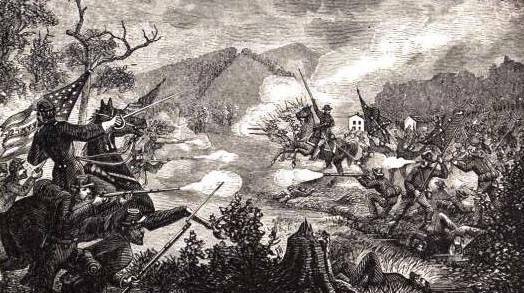 Crossed Sabers: Gettysburg in Miniature back in print! The Johnny Reb Gaming Society has printed up a fresh batch of copies of our popular all-cavalry, all-Gettysburg Campaign scenario book, Crossed Sabers: Gettysburg in Miniature. These scenarios are written by me in the same style I used for Enduring Valor: Gettysburg in Miniature, but because of time constraints at Marek/Janci Design (and because of the more limited interest in a cavalry scenario book), Debi and I decided to publish this booklet ourselves in the same format as the hard copy Charge! newsletter (comb-bound, digitally printed on our color laser printer, with spot color maps). Crossed Sabers is only $15 plus postage, and includes several original scenarios for battles from the Gettysburg Campaign. There are a wide variety of types of actions, as well as varying tactical situations and terrain, and several of these scenarios are useful for small group play. A few are fine for only 2 players (or even possibly for solo play, at least as well as Johnny Reb can be played solo). Johnny Reb Gettysburg game photos from Patrick Roovers! The Battle of Gettysburg is refought in miniature. My first two scenario books (Enduring Valor: Gettysburg in Miniature) offer more than 20 different scenarios to refight portions of Gettysburg in regimental level. These popular books are available from Marek/Janci Design and from leading Internet gaming retailers. 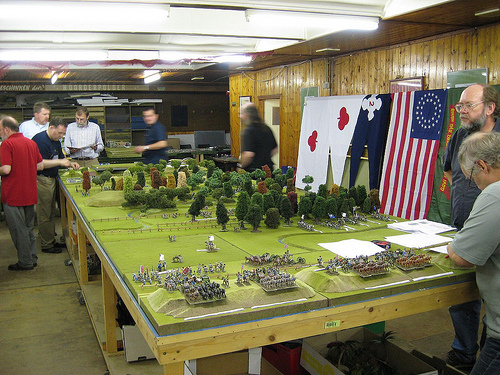 I met Belgian wargamer Patrick Roovers at the 2007 Fall-In miniature wargaming convention in Lancaster, Pennsylvania. He stopped by to watch my Johnny Reb 3 game, along with long-time JRGS member and gamer Dennis Cunningham. Patrick was kind enough this week to send me a link to his photo gallery of a recent Johnny Reb game his group ran at their club house. Check out the photos, and pay attention to the gaming venue! These guys have a great location for their gaming efforts! Thank you readers for making July the 5th straight month that the Charge blog has exceeded 10,000 page views, and we have a chance to top the all-time record of 14,000 hits! 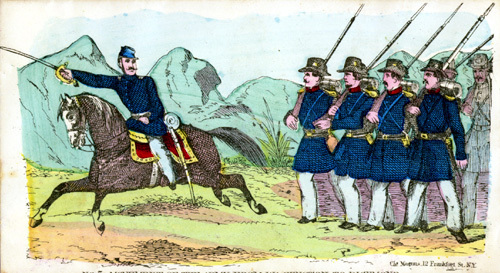 We at the Johnny Reb Gaming Society appreciate the consistent support, and welcome your comments on particular topics you would like to see covered either in the hard copy wargaming fanzine or on this weblog. This has been a very unusual summer for Debi and me. I have been on temporary work assignment in southern Ohio for much of the time, and Debi has been busy helping prepare for our daughter’s wedding. 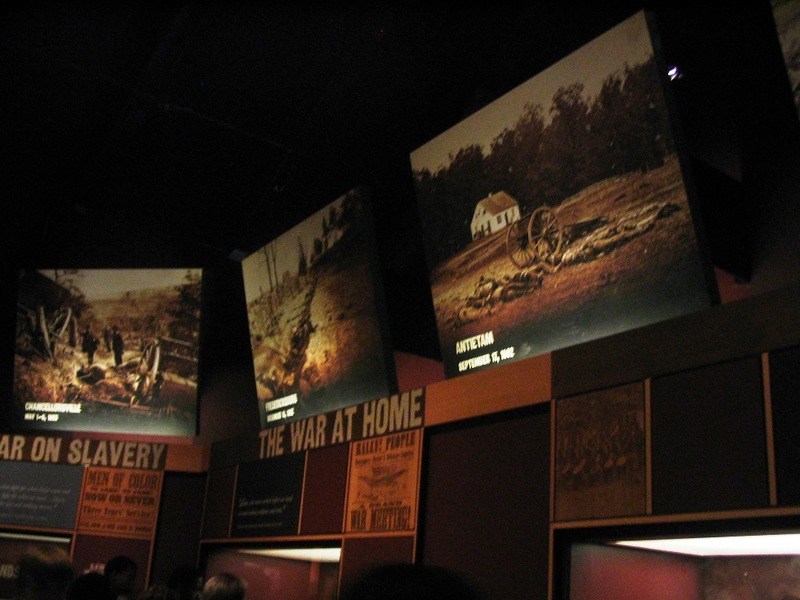 I have managed to squeeze in taking several business clients and colleagues on tours of the Gettysburg Battlefield, as well as tramp some Virginia fields I had not previously visited. Contest to win free copy of Nosworthy book! 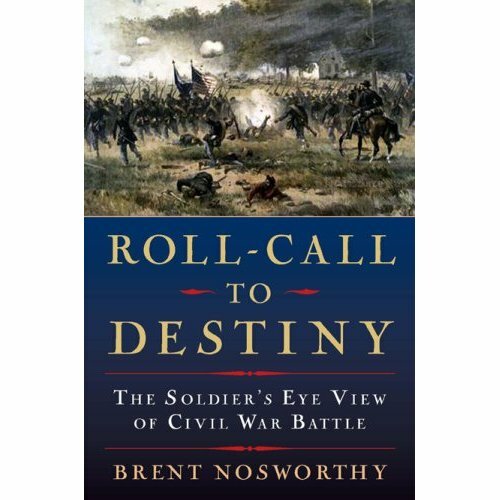 Brett Schulte of the TOCWOC blog is offering a new contest to publicize his blog, and is offering as a prize a free copy of Brent Nosworthy’s new book, Roll Call to Destiny. For more on this book, click here. Hard copy Charge #20 to be mailed early!!! Because of our daughter’s upcoming August wedding (and thanks to many writers who submitted articles early enough), Debi and I will be mailing the planned August issue earlier than usual this time so that we can focus our energies and attention on the final planning for the big event. For a father, walking my little girl down the altar will be one of the biggest highlights of my life, and we are all so excited and counting down the days. 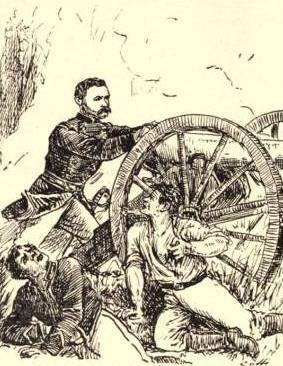 For your summer reading and miniature wargaming pleasure, here are some of the articles and scenarios you can look forward to in Issue #20 as the Johnny Reb Gaming Society closes out its 5th year as a non-profit organization, and our fanzine has become the leading current Civil War gaming periodical.